In pre-Reformation times, Crosserlough was divided into two distinct parishes – Crosserlough and Kildrumferton. The suppression of the churches in the sixteenth century led to the eventual decline of these two parishes. Through time, the two pre-Reformation parishes were united under the name ‘Crosserlough’ and a surge in church building began. A medieval parish church, dedicated to St Bartholomew, once stood in the townland of Crosserlough, adjacent to Cullow townland. The medieval church stood in what is known locally as the ‘old graveyard’. The site itself overlooks Cullow Lake. Crosserlough probably derives its name from Cros ar Loch, referring to either “cross on the lake” or “cross over the lake”. The Penal Laws were passed in Ireland in the 1690s. Religious worship by Catholics was outlawed. An article in ‘Crosserlough Through The Ages’ makes reference to the Down Survey map of the seventeenth century. The article explains that the survey referred to St Bartholomew’s Church at that time as being in a ‘state of ruin’, most likely a direct result of the restrictions brought about by the Penal Laws. These restrictions also forced local clergy to celebrate secretive open-air Masses in obscure locations and the sacredness we associate with so-called ‘Mass-rocks’ commenced in that period. Mass rocks were established in a number of townlands – Aghaconny, Aghawee, Curraghbreedin and Drumscruddan. As the eighteenth century progressed, the Penal Laws were relaxed. A thatched chapel was built in the townland of Cullow in the second half of the eighteenth century. The location of a chapel in Cullow is clearly recorded on the Griffith Land Valuation Maps dating from the middle of the nineteenth century. Griffith Land Valuation Maps can be viewed at www.askaboutireland.ie. The church was T-shaped in design and was situated in the centre of the oldest part of the ‘new graveyard’ opposite Cullow House and Latnadrona Road. Fr Liam Kelly, in his book ‘Churches of the Diocese of Kilmore’, makes reference to the fact that the church was accidently destroyed by fire in 1880. The building of a new parish church was completed in 1888 and it was dedicated on 25th November that same year in a ceremony led by Bishop Edward McGennis. A chapter entitled ‘Church History’ can be found in ‘Drumkilly – From Ardkill Mountain to Kilderry Hill’. The beginning of the chapter outlines, in detail, the importance of Kildrumferton as an ecclesiastical centre. Druim Feartain (Drum Ferton) was an area on Lough Sheelin that was associated with St Carthach, a great church builder of the 6th Century. With the arrival of Christianity, the name Druim Feartain eventually changed to ‘Kil’drumferton (‘Kil’ in this instance referring to a ‘church’) and it is highly likely that the place became closely associated with the Benedictine Abbey in Fore (County Westmeath). Kildrumferton probably existed as an ecclesiastical centre from the sixth century. The parish church of Kildrumferton was centred in the townland of Kill, with St Patrick designated as its patron. It served the local population until its confiscation during the Reformation of the sixteenth century. The church structure at Kill deteriorated through time, but it was partly repaired during the seventeenth century and was used for religious services by the Protestant population. A new Protestant church was built in Carrickacroy in 1812 and the local Church of Ireland community chose to continue using ‘Kildrumferton’ as the parish name. 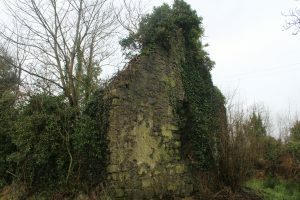 Once the new church opened in Carrickacroy, the former church in Kill was used as a school until the 1820s/30s and fell into disrepair thereafter. St Patrick remains the patron of the Church of Ireland Parish of Kildrumferton. According to ‘Lewis’ Topographical Dictionary’ (1837), a well-constructed chapel existed in the townland of Drumkilly in the late 1830s. It was probably built during the second half of the eighteenth century. It was used as a place of worship until the present church was built during the Great Irish Famine of the 1840s. 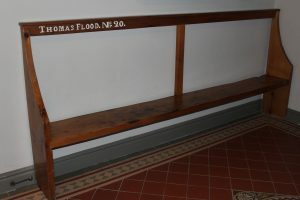 Thereafter, its sole use was as a school until Fr John Boylan built a new school in Drumkilly in 1886. The Penal Laws of the seventeenth and eighteenth centuries forbade Catholic education. Hedge schools developed as a direct result of these laws. 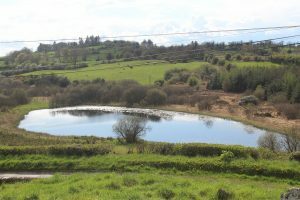 Many such schools were recorded in the parish of Crosserlough – Pollareagh, Drumroragh, Cullow, Drumkilly, Coolkill, Togher and Upper Kill, to name but a few. A relaxation of the Penal Laws eventually led to the establishment of a national system of primary education in 1831. Through time, improvements were made in the quality of school buildings, teaching standards and curriculum content. 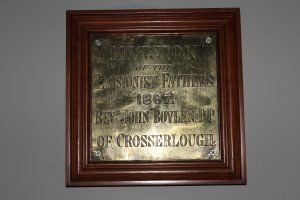 Fr John Boylan was instrumental in the building of national schools in the parish during the nineteenth century – Drumroragh, Crosserlough, Rassan, Aghakee, Drumkilly, Ardkill, Kilderry and Aghaconny. Teacher residences were built beside some schools.